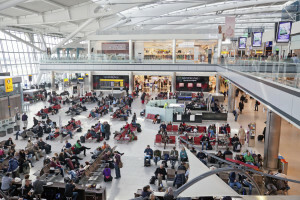 Millions of people fly on thousands of planes every day and with large numbers of people passing through airports, such large gatherings in relatively small spaces presents an obvious target for terrorism and other crime. Airport Phones Intercom Systems provide a first line of defence against attacks and crime. From the external fences which enclose the airport to sensitive areas like terminals and baggage handling facilities, security checkpoints and security staff and patrols use AlphaCom, Pulse and Pro700 for effective internal communications. The Pulse and Alphacom are used for Airport Intercom Systems, providing airport announcements, group calls, alarm distribution and more. These features allow an airport to easily customize its communications for specific requirements and needs. The Pulse and AlphaCom systems can be linked to CCTV, Phone, Mobile Radio and public address systems. With the link to CCTV it is possible to automatically select the relevant CCTV camera associated with the Intercom station calling and provide visual confirmation of the person calling. the phone and mobile radio interface gives the option of directing intercom calls to locations where there is know intercom positioned, or links to remote locations i.e mobile phones or mobile radios for security guards. When the intercom system is linked to the public address calls can be put into multiple groups, calls can be sent to all call, group call or multiple group calls. With the AlphaCom XE range standard announcement can be stored and sent out at pre-set times or linked to events happening in the airport. The AlphaCom XE also has the facility to record and store communications made on the intercom system and public address, these are all date and time logged so can be monitored at a later date if required. There are a wide range of stations available, these include Control Room, Desktop or Wall mounted, Vandal Resistant Industrial and door entry sub-stations. with intercom systems that range from 2 stations to many thousand stations we have an intercom system to cover every requirement.